The so-called ‘Fresh Start’ agreement comes after ten weeks of talks aimed at reviving the main elements of the failed Stormont House Agreement, which was reached in the run-up to last Christmas. Unionist commentator Newton Emerson said he was unnerved by what he described as a “total defeat for Sinn Fein”. He warned the deal was “destabilising and unsustainable”. Every aspect of the negotiations saw setbacks for nationalists, republicans and progressives. Arguably the most controversial development was that an entire section of the previous agreement on dealing with the past was shelved. That component was dropped over the British government’s insistence that its “national security” take precedence over the release of information to victims of the conflict. Sinn Fein officials said no deal on legacy issues was better than a bad deal. However, victims groups said the party should have refused to sign up to any agreement at all. “In their homes around the country, those who lost loved ones in the conflict will be privately grieving and angry,” said Relatives for Justice and Justice for the Forgotten. On the welfare issue, Sinn Fein pointed to a headline figure of financial measures of 146 million pounds a year to compensate those affected by cuts in welfare and tax credits. 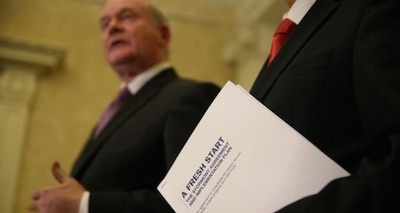 Overall, however, the ‘Fresh Start’ agreement contains less money than the Stormont House deal it is meant to replace, to the tune of 85 million pounds. A broad range of left-wing groups and political parties have denounced it, and protests have already been organised for this weekend. There are reports that some in Sinn Fein could rebel against the deal. The party’s leader on Belfast council Jim McVeigh, in a message to supporters, warned that planned cuts in corporation tax might not go ahead “unless we afford it and we won’t be able to afford it any time soon, comrades”. The new deal includes cuts to all working age benefits, a benefit cap for families with children, and also agrees to another round of cuts currently before Westminster. “It is overwhelmingly children who will suffer,” said Eamonn McCann of People Before Profit. He said Sinn Fein had now joined the ranks of the pro-austerity parties. The British Crown Forces in the North are the new deal’s clear financial winners. The PSNI and a new cross-border agency will receive 160 million pounds of additional funding over the coming years, with an additional 85 million pounds to secure interface area as well as issue payments to “community workers”. The deal appears stacked against republicans by concentrating on illegal cross-border activity -- there is no requirement for the PSNI or other British state agencies to address loyalist criminality or sectarian and racist violence. In another embarrassing development, Sinn Fein was required to openly cut its ties to the Provisional IRA’s Army Council by agreeing to a principle to “accept no authority, direction or control on our political activities other than our democratic mandate alongside our own personal and party judgment”. Neither unionists nor the British government have an equivalent commitment to end their co-operation with loyalist paramilitaries. In a key intervention, the United Nations Special Rapporteur on the promotion of truth and justice, Pablo de Greiff, warned against the British stance on dealing with the past. He said it had worked “to cover up the action of their agents, army, police and political establishment by using a so-called national security veto. “That pretext for blocking disclosure is clearly nonsense as much of the information families are looking for is related to events 30 to 40 years ago,” he said. Brian Gormally of the Committee for the Administration of Justice described Mr de Greiff’s remarks as “significant”. Accusing the British government of pulling down the shutter on legacy investigations, he said: “This is contrary to international standards and unacceptable to victims. Relatives for Justice spokesman Mark Thompson said British ‘national security’ issues were not raised during the Stormont House Agreement last year. “It’s introduction was an indication that the British government do not want to face into the truth of their responsibility and role in the conflict,” he said. The other political parties at Stormont sought more time to examine the contents of the agreement when it was released on Tuesday. However, the welfare element was pushed through by Sinn Fein and the DUP at the Belfast Assembly within 24 hours. The motion ended Sinn Fein’s opposition to the Tories directly legislating on the matter from Westminster. There are fears that the axe is now set to fall on a range of crucial welfare payments and frontline public services as collective punishment of the nationalist community. In the day-long debate, Sinn Fein was accused of capitulating on its main ‘red line’ vow to oppose Tory cuts, and also needlessly agreeing to give London 60 million pounds a year to balance potential changes to tax credits. Sinn Fein denied it was supporting austerity in the Six Counties but opposing it in the 26 Counties. Its Minister for Regional Development Conor Murphy said the devolved administration had acted as a “bulwark” against the Tory government’s austerity policies. However, SDLP deputy leader Fearghal McKinney accused Sinn Fein of a u-turn. “We are being asked to hand over to the Tories - or ‘Thatcher’s children’ as Martin McGuinness likes to call it - decisions on legislating on welfare,” he said. In its response, Republican Network for Unity spokesperson Nathan Stuart said the Sinn Fein had agreed on a document that “would make Margaret Thatcher blush”. “Once again, and after a nine month delay, the right-wing coalition in Stormont have shafted the Irish working class in favour of feathering their own nest,” he said. The 1916 Societies said the fact that Sinn Fein had agreed to move forward while Britain still refused to admit its ‘Dirty War’ was a “clear demonstration of who holds sway in Ireland”. “The Sinn Fein project of drawing power away from Westminster, supposedly towards regional decision-making processes, stands in ruin, the handing back of key powers to London exposing the same as facade,” they said. But Sinn Fein insisted the deal was an important milestone. “I am hopeful that we will be able get on with the important work of building a fairer society for all the people on the island of Ireland,” said the party’s Galway West election candidate, Trevor O Clochartaigh. “The agreement is as Deputy First Minister Martin McGuinness described it, evidence of a common commitment to a better future,” he said. “There are of course aspects of the agreement that we may not be overly happy with but there is enough in it that is positive and constructive and allows us to move forward.